We have just finished celebrating the fourth of July! My family and I have enjoyed a carnival with heavy, indulgent fair food (cotton candy, lemon shake-up, fried potatoes, and corn dipped in way-to-much-butter - shared between the five of us), a symphony that we brought our own picnic to (bbq pork sandwiches, pasta salad, fruit skewers, jello stars, chips & cookies), a baby shower for a friend, a parade, a graduation open house, an evening of games and fireworks with neighbors, and finally a bbq with some family and a few friends at our house yesterday! It's been a very full and very delightful few days. As I write this, the kids are settled into bed and probably won't know what hit them when our normal schedule goes back into effect. :) But this is what makes summer so delightful and fun. Anyway, I'm giving you a preview of our post for tomorrow! I made two recipe from the July issue of Food Network Magazine and decided to share one of them today. This slaw was so good! I decided I absolutely had to try it when I noticed that an almost identical recipe appeared in the July issue of Bon Apetit. So interesting that they feature the same slaw and now I know why - it's different and unique, very pretty, and completely delicious! Make the dressing by combining the sour cream, mayonnaise, sugar and the zest of the limes in a medium bowl. Season with salt and pepper and finish with the juice of the limes. 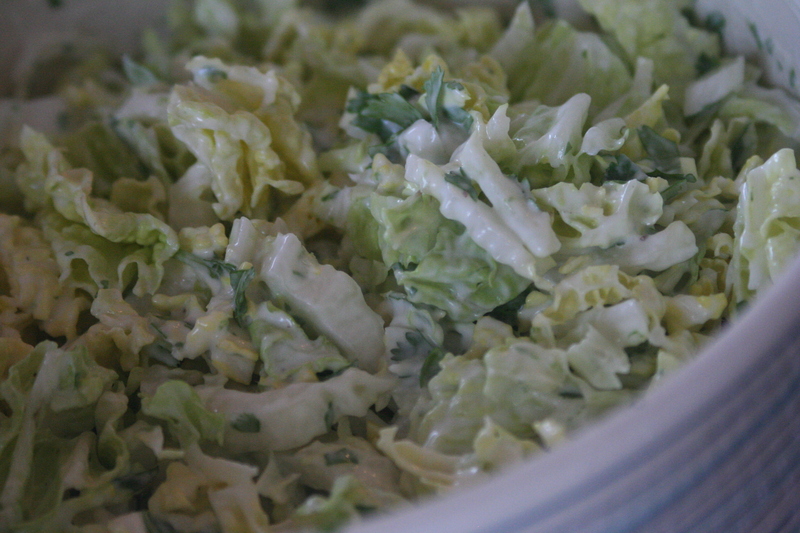 Pour the dressing over the cabbage mixture and toss to combine. I love to entertain, but I also struggle with finishing things up in the kitchen as people are arriving and keeping everything hot at the same time. Sounds like you had much success! Wish I could have joined in some of the celebrations! I think I'm going to try the slaw recipe. I actually have some napa cabbage in the fridge. The only ingredient I'll need to buy is cilantro (my plant didn't work out so well).